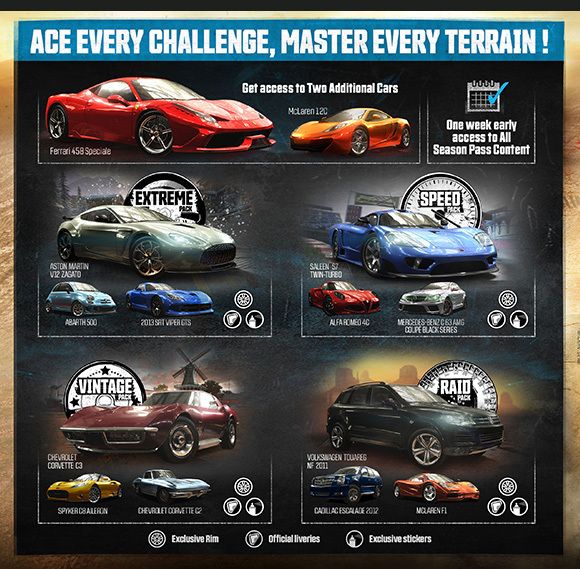 Ubisoft have released the first DLC for their cross-state racer The Crew with both free and premium content available. Featuring three electrifying new cars, the smooth and extremely rare Aston Martin V12 Zagato, the ferocious 2013 SRT Viper GTS and the zippy Abarth 500, the Extreme Car Pack will have racers hugging turns and flying across the United States. New customisation options including paint jobs, rims, interiors and tuning specs are available in the in-game store for select cars. Defy gravity in “Hurricane” with difficult jumps on a demanding stunt-filled course located in a construction site. The Extreme Live Update also comes with new unlockable content. Enrich your car collection with new tuning specs for five of your favourite cars and show your ride’s wild style with the new “animal” and “nature” stickers. This DLC forms the first part of the Season Pass content, with 3 more planned packs coming soon.